Mason jars are the best thing to happen to salads since lettuce. 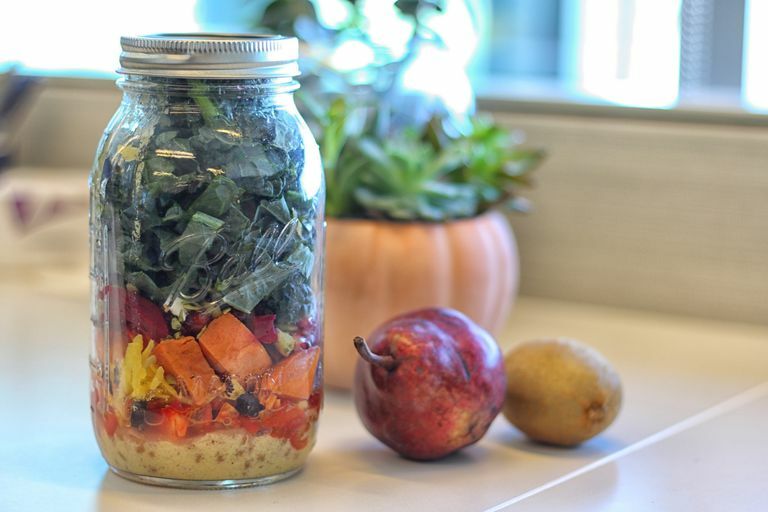 I’ve always been a fan of salads, but I’m especially loving the "salad in a jar" trend. Now you can pack a salad the night before without worrying about sogginess. A tall glass mason jar is essential when making salads ahead of time. Packing your salad vertically allows you to store the dressing in the bottom of the jar and your lettuce at the top. This way, the two won’t touch until you shake the whole thing up. Romaine, spinach, kale, arugula, red leaf, iceberg, broccoli coleslaw mix — they’re all tasty and low-calorie options for the base of your salad. Choose one, or create your own combo. My go-to? Chopped romaine. Chopped, skinless chicken breast is classic, as is tuna (previously packed in water as opposed to oil). But get creative: Try hard-boiled egg whites, chopped turkey breast, shrimp, extra-lean ground beef, lean ground turkey, even a chopped veggie burger. Just make sure your protein is completely cool before layering it into your jar. Nobody likes wilted lettuce! Just because it's a salad doesn't mean it's "healthy!" Be smart about your ingredients. Add as many fresh veggies as you like: tomato, cucumber, carrots, mushrooms. For extra protein and flavor, choose one or two of these: black beans, kidney beans, chickpeas, edamame, corn kernels, avocado, reduced-fat cheese, dry-roasted nuts. On the no-no list: fried toppings, candied nuts, most full-fat cheeses (grated Parm and crumbled feta are great because a little goes a long way). P.S. Those beans are great for burning fat. I like to look for light dressings with 50 calories or less and no more than 3 grams of fat per 2-tbsp. serving. I love the creamy kinds made with Greek yogurt. Most importantly: Watch those portions. Grab a measuring spoon, and put it to good use. Other options? Use salsa, or mix your favorite flavored vinegar with a just a bit of olive oil. Step 2: Add your protein and mix-ins. Pack hearty vegetables like peppers, tomatoes, and cucumbers closest to the dressing — they’re the least likely to get soggy. Leave plenty of room for lettuce. Step 3: Finish things off with your greens, filling the jar to the top. Don't pack it in too tightly, though, or the dressing won't distribute well when you shake it later on. Step 4: Screw on the lid, and place the jar in the refrigerator. Resist the urge to shake it up. When you’re ready to eat — whether it’s that afternoon or for lunch the next day — shake the jar to cover its contents with dressing. Then flip everything into a bowl (or eat it straight from the jar).